Before the Marquis, there was the Misere~ who appears in both Les Preludes and the fourth chapter of "Danse Macabre" (in the Marquis:Inferno collection). Even though his appearance is brief in the story, I wanted him as fully realized as the other main characters. His costume was based on plague doctors of the 14th century with some redesigns to make him unique and fit him within the world of the Marquis. Along with the toned model sheet reprinted in the Inferno sketchbook, I also did this finished drawing back in 1999 to get a feel for the character. Oh! I do love that concept. Dead-bird in a demon tree and a birdly masked pest raider... fine! I've always loved the Misere. Love the details on the gun stock! Great stuff, guy! No offense to my love of the Marquis, but I have a special place in my heart for Misere. 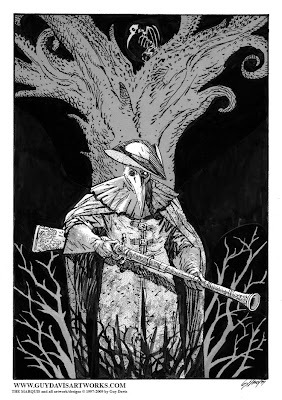 It stems from a balance of the plague doctor elements (which I've loved since seeing Robert Downey Jr. don the outfit in RESTORATION) and his appearances in the story which always seem to herald some sinister revelation for the audience. Any masked character wielding a long rifle like a quarterstaff and carrying about specters like the Ghost of Christmas Future is ace in my book. The townspeople prayed for a savior...what came was the devil. First seeing print in 1997, The Marquis is the comic series creation of artist/writer Guy Davis. An action/ horror series that followed the life and damnation of The Marquis Vol de Galle, his fight against the devils of Hell and his own faith and madness. The Marquis is now being published through Dark Horse Comics, beginning with "The Marquis: Inferno" which collects the stories from both Danse Macabre and Intermezzo along with an expanded sketchbook section and full-color cover gallery. Since it's creation, The Marquis was always planned as a finite series, and now through Dark Horse the remaining storylines will be coming out as original graphic novels beginning with “The Marquis and The Midwife”, to be followed by the last two books that tell the complete story of the Marquis Vol de Galle. In addition to the english language editions from Dark Horse, the French versions of the series have been collected into deluxe hardcover formats through Les Humanoïdes Associés along with Spanish editions through Norma Editorial. Creator of THE MARQUIS published by Dark Horse Comics. Past comic work has included B.P.R.D, SANDMAN MYSTERY THEATRE, THE NEVERMEN, BATMAN NEVERMORE, THE ZOMBIES THAT ATE THE WORLD, FANTASTIC FOUR/ UNSTABLE MOLECULES, BAKER STREET and animated comics for both the PAN'S LABYRINTH and HELLBOY 2 dvds. Other works have included spot illustration for the White Wolf role-playing books and conceptual design for film/television including prop design for the animated pilot to Mike Mignola's THE AMAZING SCREW-ON HEAD and conceptual work on AT THE MOUNTAINS OF MADNESS, PARANORMAN and Guillermo Del Toro's upcoming PACIFIC RIM film and InSANE video game. It's the Great Pumpkin, Vol de Galle! The Marquis is ™ and © 1997-2011 by Guy Davis.